A log and plaque commemorate the foresters and the forest managers and their work in conserving the Barmah Forest. 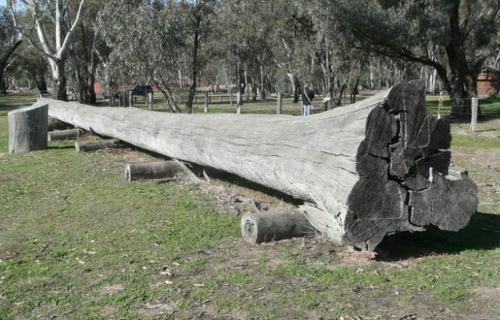 This log was a River Red Gum tree that once grew near island lagoon in the Barmah Forest. Unfortunately it fell down in 1999. It is recorded in the Significant Trees section of the 1992 Barmah Forest State Park and Barmah State Forest Management Plan, as "Assessor`s Pile: with a heigh of 42.2 meters and a girth of 2.9 meters. It was placed here by the Dept. of Natural Resources and Envrionment Forests Service, Parks Victoria and the Barmah Forest Preservation League, to commemorate the commitment of dedicated Foresters and Forest Managers, to the ongoing conservation and sustainable management of the Barmah Forest.